Straight from East Timor, we flew back to Bali for a couple of days before taking another flight to Singapore. It’s the third country for our SEA2Africa two-month summer trip, and why Singapore? Well, next to Malaysia, we love Singaporean food! Plus, after almost a month of traveling, we’re hankering for the comfort of a first-world country—spell, fast food. 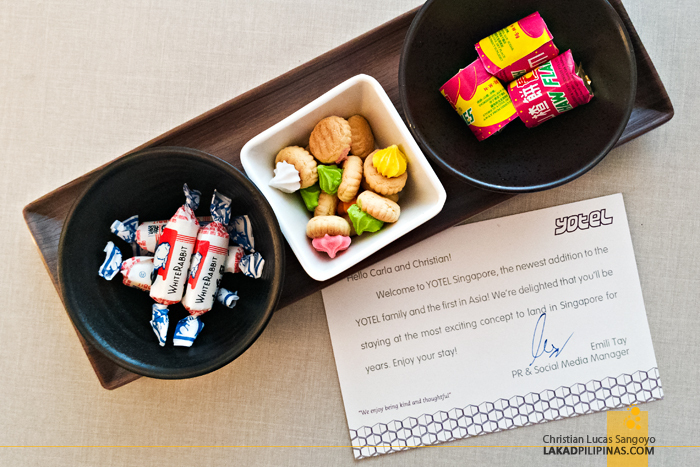 So, we’re spending four days on this leg of our trip and our lodging of choice is YOTEL Singapore. YOTEL? The name sounds cool, indeed. 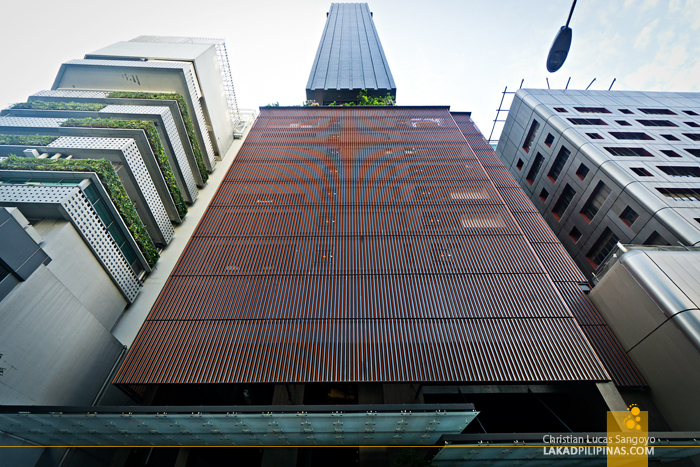 Tucked on one of the quieter parts of the bustling Orchard Road, the hotel is sleek and very modern. It has branches in London, Boston, Amsterdam, and New York, and this is the first one to open in Asia. The lobby is set in cool whites with slit lights acting as accents. 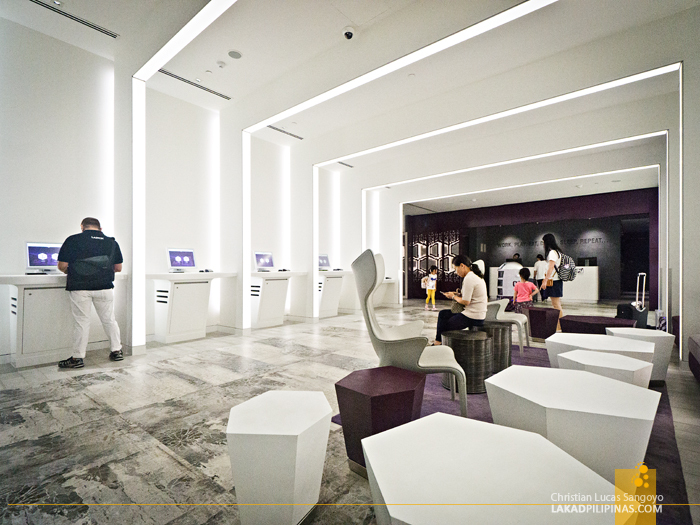 We checked in on a busy day, but even though the reception desk was full, we got to check in in a flash—they have self-check in kiosks! Nice. It’s one of the first hotels I’ve seen with such. On one corner stands an R2D2-ish robot, and apparently, this guy brings hotel amenities like water bottles and towels to rooms by itself! Neat! We were billeted on the 23rd floor of the building. 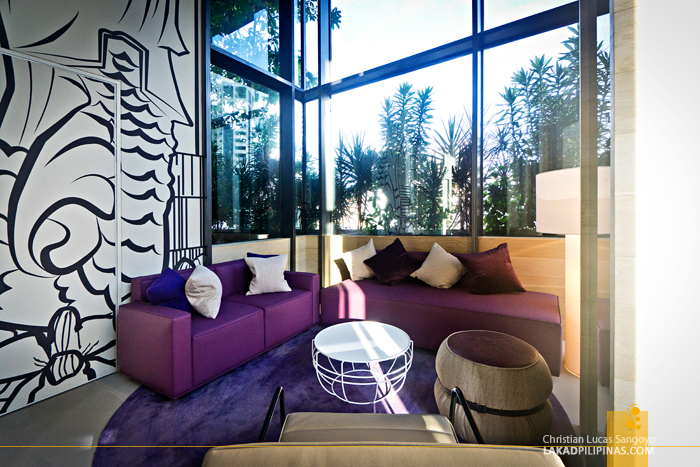 YOTEL refers to their rooms as cabins [CHECK DISCOUNTED RATES]. Like airline cabins. 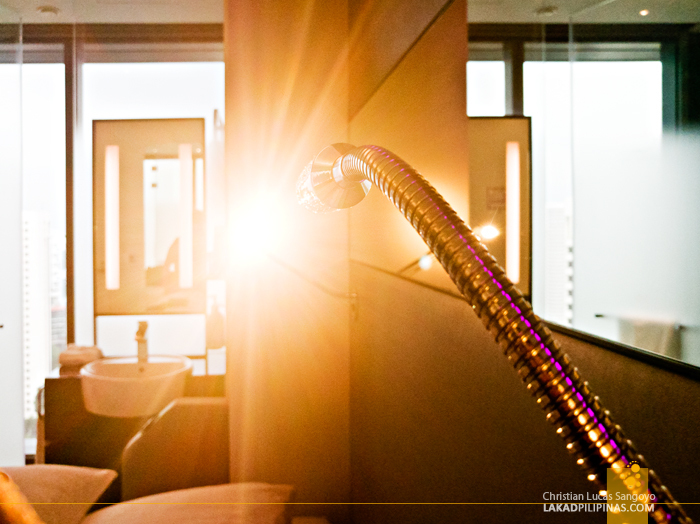 The concept of the hotel is to mimic the first class accommodations of airplanes. 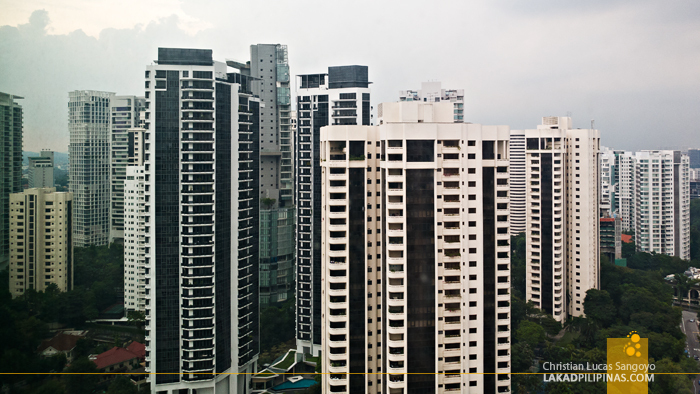 With Singapore’s extremely limited real estate, this actually works quite well. 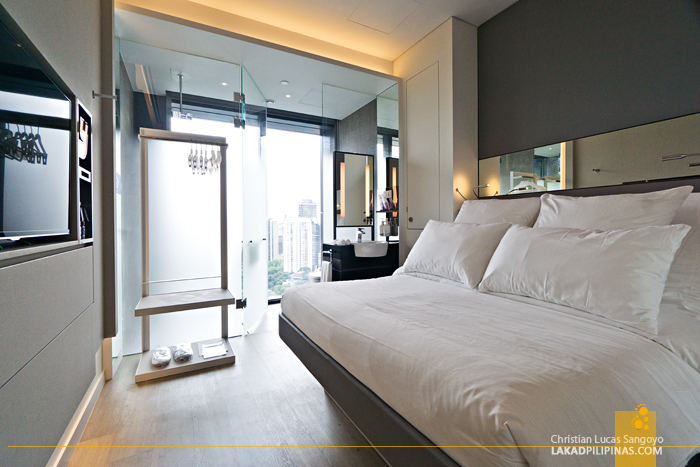 But fear not, even with the 16-square meter space, the room doesn’t feel lacking at all. At the center of the room is an automatic foldable bed, the trademarked SmartBed, it can turn into a comfy sofa at a push of a button—similar to full recliner seats on planes, only this one is huge. It has reading lights on both sides, a multi-purpose side table on the right which contains a mini-fridge, electronic safe, a work desk, a foldable chair, and coffee and tea facilities on top! Whew, that’s a lot of things crammed niftily on a very small space! On the left is an open lavatory complete with bathroom amenities. 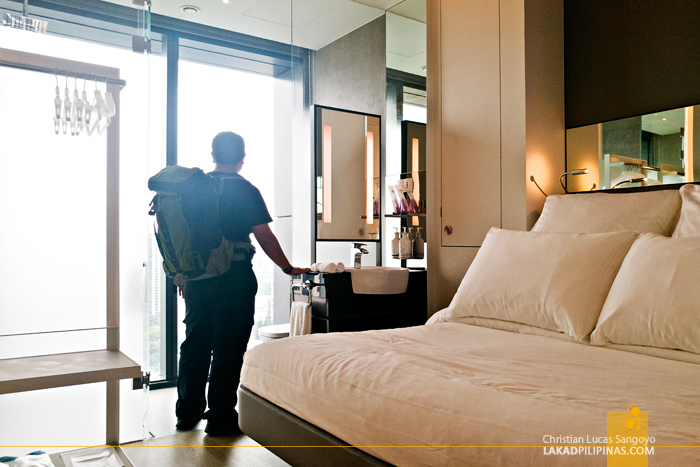 And on its back is the toilet and bath that has a full view of the Singapore skyline. I like this. It eliminates the need to wait for your roommate to finish at the toilet if all you need to do is brush your teeth or retouch your make-up. Not that C uses make-ups, lol. 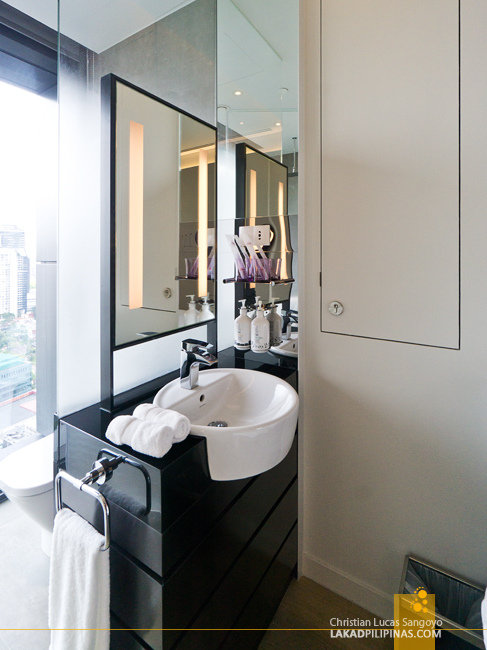 I also like the fact that the bathroom’s floor-to-ceiling window acts as a normal window when no one’s using the toilet. Again, nifty. Well, it can also serve those who has a fetish of taking a bath for all the world to see, haha. 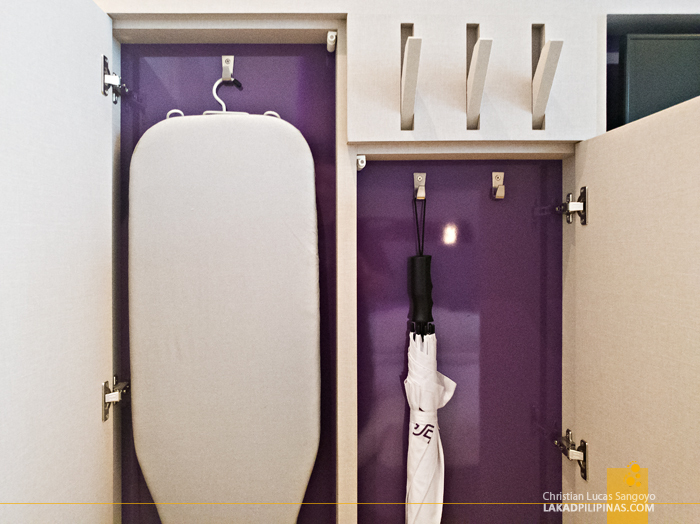 Luggage can be a problem for tight rooms like these, but YOTEL, it seems, has thought of everything. There is ample storage underneath the bed, and an open closet on one side of the room for hanging clothes. Some parts of the wall also open with secret compartments where you’ll find ironing boards, flashlights, and umbrellas. Wall hooks for coats and what-nots are also available, via flippable portions of the wall. Very clever. Wi-fi is extremely fast. 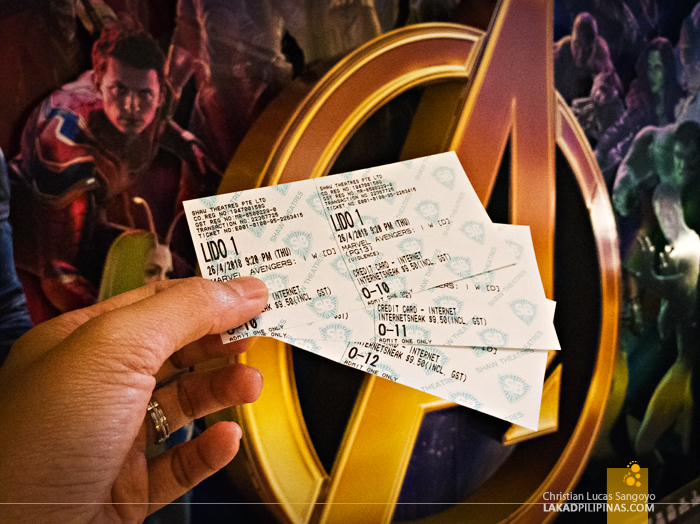 We planned on watching the Avengers on nearby theater the same night we arrived, problem was, we haven’t seen the previous Thor movie that connected with it. It took less than ten minutes to get a copy of the movie. Which we then plugged on the huge flatscreen TV and watched just right before we took off to the cinema. 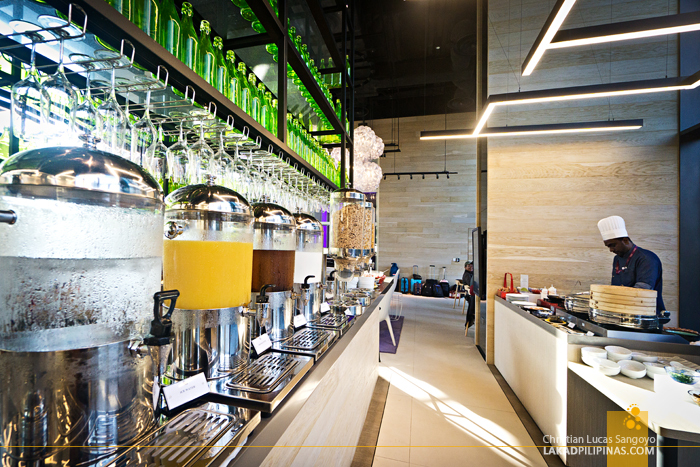 Unlike airplanes though, YOTEL has full service amenities like normal hotels. 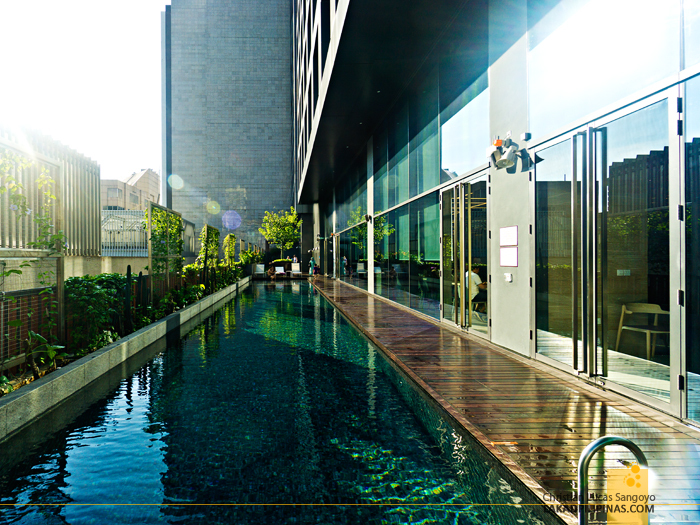 It has an in-house restaurant, a gym, a co-working studio (if you find your room to be too cramped), and an outdoor pool. Our stay came with complimentary breakfast and for three mornings, we get to finally binge on bacons. Crisply fried bacons. And runny eggs. Very runny eggs. After coming from Dili, where food options isn’t really that comprehensive, this was heaven. 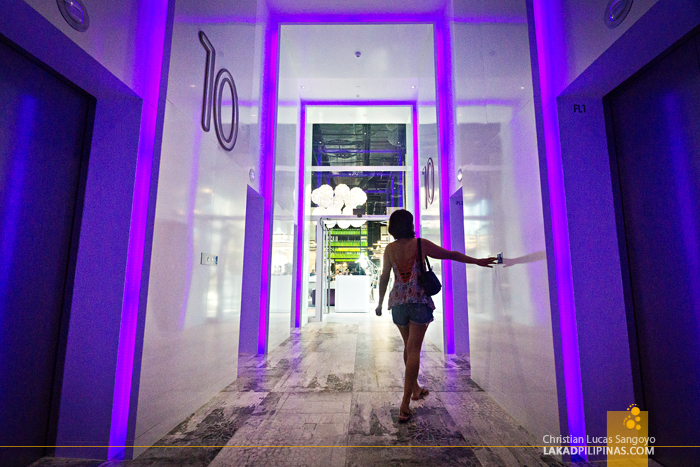 Besides all these things, YOTEL has one more thing up its sleeves—its location. I like how quiet the area it’s on even if it was on Orchard Road. This place is extremely busy, with its shopping malls, restaurants, and shops. Heck, we even found a Jollibee on one of the malls—Chicken Joy! 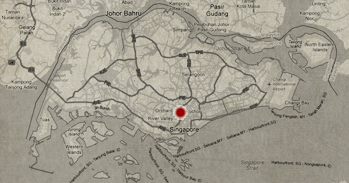 We also planned on finally visiting Singapore’s only UNESCO World Heritage Site, the Singapore Botanic Gardens, and we were there in no time, the hotel is near a subway and a bus station. Hands up for YOTEL. We can’t think of anything else this hotel haven’t thought of.